Complete with sprawling forests, towering mountain peaks, and seemingly endless waterways, Maine has become a mecca for outdoor adventurers. In 2016, “The Vacation State” attracted almost 36 million tourists—a number that has been consistently on the rise in recent years. With more than 6,000 lakes and ponds, 30,000 miles of rivers and streams, and an expansive shoreline, Maine is the perfect destination for anyone who wants to spend time out on the water. Maine’s Lakes and Mountain region, in particular, has some of the most beautiful landscapes in the state. Here are a few options for getting on the water the next time you visit our part of the state. 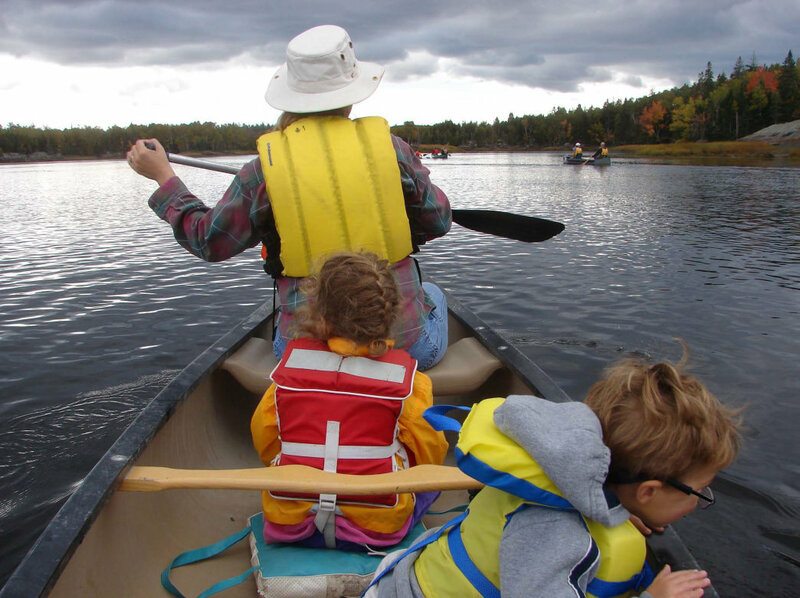 Take a relaxing canoe paddle with the family. There’s not much more relaxing than paddling a canoe through the wilderness, and Maine has no shortage of suitable venues for just that. The ambitious paddler with lots of time has a few fine options. Roughly half of the 740-mile-long Northern Forest Canoe Trail runs north through Maine’s north woods. Starting in the west at Umbagog Lake it ends at the St. John River on the Quebec border. Plan a weeks-long canoe-camping trip through this riverine wilderness and take in the aromas and sights while keeping an eye out for moose, bear, loons, and other wildlife along the way. Along the NFCT is Flagstaff Lake, the perfect place to spend a sunny day. The lake is nearly 30 miles long but is fairly shallow and bordered by the soaring peaks of the Bigelow Preserve. The wind can really kick up in the open water, so paddling beyond the cove is only recommended for strong paddlers. You’ll also be safe from high winds if you stick close to the shoreline, which is a great spot for a stand-up paddleboard, canoe, or kayak. Take your time in the Rangeley Lakes region, where there are several lakes—large and small—waiting to be explored by canoe or kayak. Last but not least is Sebago Lake, carved by ancient rivers and glaciers. Maine’s deepest lake has something for anyone who likes to spend time on the water and is a beautiful place to paddle around at sunset. Sebago Lake State Park on the north shore is especially popular with families, and many return year after year to hike, bike, or enjoy the water. The deep hole below Screw Auger Falls is a local favorite. There’s no better way to cool down after—or in the middle of—a long day’s hike than a refreshing dip. 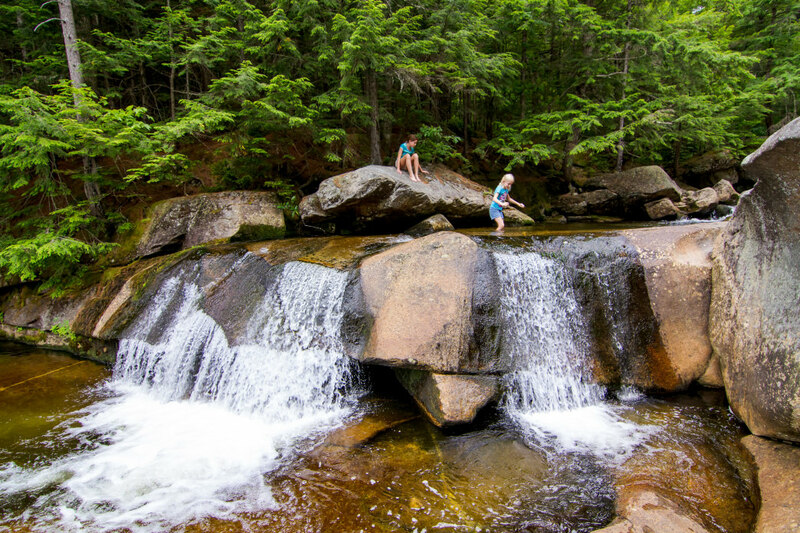 And with Maine’s abundance of freshwater, there are plenty of great options. During the low summer flow, Frenchman’s Hole on the Bull Branch River near Bethel is a popular spot, and for good reason. Its high rock walls and deep plunge carved by the 10-foot waterfall allow safe diving from upstream, while smaller, bathtub-sized pools above the falls are great for families with smaller kids. The deep hole below Screw Auger Falls is a local favorite for a cool dip on a hot day. The aquamarine waters of Rattlesnake Pool in Oxford County are as clear as they are cold. Follow the small white signs on the Stone House Trail in Evans Notch to get to the Rattlesnake Pool. Maine has options for anglers of all ages. Angling is an age-old tradition in the great state of Maine, and its waters are rich with many species of fish. 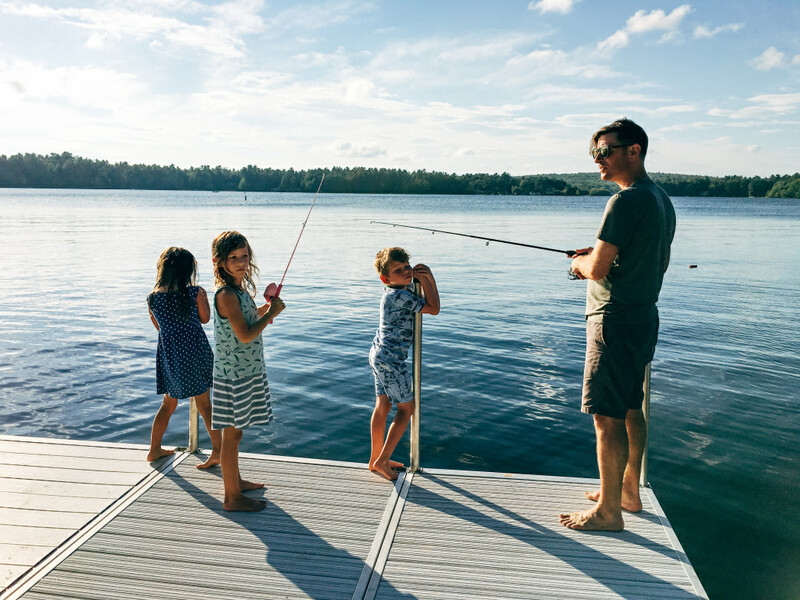 Just minutes from the town of Portland, Sebago Lake (Maine’s second largest) offers exceptional largemouth and smallmouth bass fishing. In May and June, as the water warms and the fish become concerned with spawning, fast action can be had along the lake’s rocky shoreline. Landlocked salmon and lake trout (togue) can be caught in deeper waters, too. If you’re looking for brown, rainbow, and brook trout or smallmouth bass, cast your line in the Upper Androscoggin River. And of course, you can ice fish throughout the state in the winter when the weather gets cold enough. The Oquossoc area is home to six major lakes, perfect for a relaxing boat ride. If you enjoy boating at a more relaxed pace, there are plenty of opportunities in Maine’s Lakes and Mountains region to spend a day out on the water with someone else at the helm. 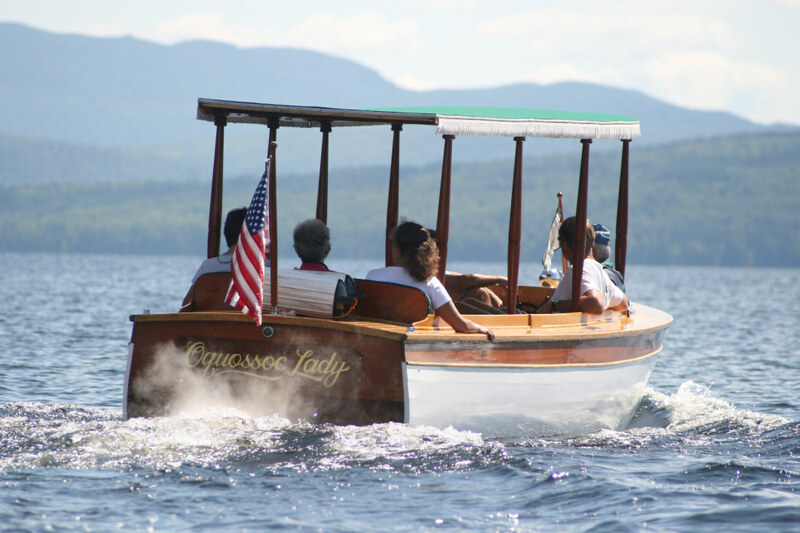 Head over to the Rangeley Lake State Park for even more boating opportunities. You’ll also find a boat launch here, which makes exploring the nine miles of cool, pristine water a breeze. There are plenty of trails in the area to keep you busy on land, too, and 50 camping sites near the water if you decide to stay a night or two. If you’re interested in learning more about the history of the area, book a ride on the restored wooden “Oquossoc Lady” or the “Gray Ghost.” And don’t forget to keep an eye on the sky for the chance to spot a majestic bald eagle! Sebago Lake State Park offers a boat launch if you have your own watercraft, or sign up for a 2-hour captained cruise with Sebago Sailing. Take a ride on Flagstaff Lake in a pontoon boat with Master Maine Guide Jeff Hinman. Take in scenic views of the Bigelow Mountain Range. Learn the fascinating history of Flagstaff Lake and the lost village of Flagstaff. Spot native Maine wildlife like bald eagles, loons, and even the occasional moose. With thousands of lakes, ponds, and rivers dotting its vast landscape, Maine offers an abundance of options for any water enthusiast. While these suggestions are some of the best spots around, there are many more just waiting to be explored. Get a Free Visitor’s Guide and make the most of your next trip to Maine’s Lakes and Mountains. Written by Matthew Reilly for RootsRated in partnership with Maine’s Lakes and Mountains Tourism Council.